A Shepherd's Heart: Putting Your Faith In God's Timing. 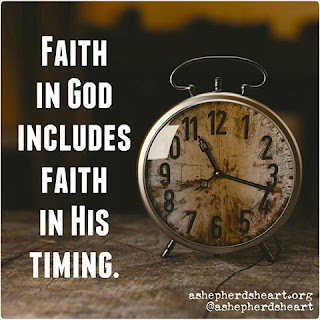 Putting Your Faith In God's Timing. Do you find yourself putting your faith in your own timing and plans or other shifting or temporal things? Or, do you strive to put your faith, trust and hope in God's perfect timing, purpose, will and plans? No matter what, as you daily abide in and walk with Him, let me encourage and challenge you to seek Him first...seek His wisdom and direction. Seek His perfect timing, purpose, will and plan rather than your own as with His wisdom, direction, power and strength...you will find a clearer pathway as you trust in His timing. Let's pray for each other that we will do this each day no matter what we face!